Highlighter -- use this to color in or underline text. Tag -- use this to tag a selection as a certain topic, for easy finding later. Note -- add a note to the selected text, to record any information you would like to remember later. Link -- link the selection to a different passage of text in your Library. Bookmark -- add a bookmark at this specific location. Share -- send this passage to someone via text, or create an image quote to share on social media. Copy -- copy the selection to your device's clipboard, and you can Paste it wherever you would like. Quote -- add the selection to your Quote Vault. You can add bookmarks to individual pages in eBooks or on individual chapters on auidobooks. To add a bookmark, simply tap on the icon that looks like a rectangle with triangle cut out of the bottom -- this resembles a bookmark! Then, tap on "New Bookmark". In an eBook, you will be given the opportunity to name the bookmark. Type what you would like to remember, and then tap on the green check to save the bookmark, or the red x to cancel. 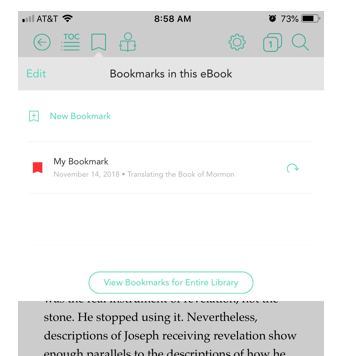 Once you have a bookmark saved, it will appear in the "Bookmarks in this eBook". This can be accessed by tapping on the bookmark icon again. To go to the bookmark, simply tap on it. To move a bookmark, you can simply tap on the rounded arrow of a previous bookmark, or you can add a "New Bookmark" and delete the old ones. You will be able to manage all of your bookmarks from your My Markups page. The book will have to be downloaded in order to manage the bookmarks, but you will be able to remove bookmarks or quickly access them from this page. To add a tag to a passage, press and hold your finger on a passage of text, and adjust the boundaries of the desired selection, then tap on the "Tag" icon. You will be able to tag the selected passage by either creating a new tag, or by selecting an existing one. For example, you can tag a selection as "Faith". 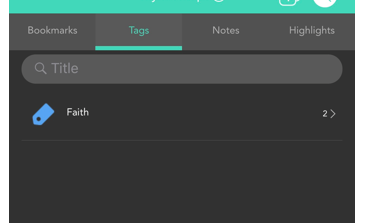 In the My Markups page, you will be able to see all of the tags you have created, as well as a quick link to all of the passages you have tagged as that topic. To add a note to a passage of text, press and hold your finger on the text, and adjust the boundaries of the desired selection, then tap on the "Note" icon. A new screen will pop up that will allow you to type anything you desire, and will save the note to the spot you selected. You will notice a "Note" icon next to the text. You can tap on the icon to view the note you have saved. You may also manage and view your notes by book in the My Markups tab. 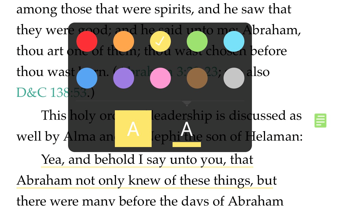 To highlight a passage of text, press and hold your finger on the text, and adjust the boundaries of the desired selection, then tap on the "Highlighter" icon. The last color/style you used will be the default for the highlight. To change this, tap once on the highlighted section, and the pop-up will contain new images. Tap on the color palette to bring up the different options for the highlight. Here you can choose the color of the highlight, as well as if you want to simply underline or fill in the entire selection with the selected color. You will be able to view all of your highlights sorted by book in the My Markups tab.